​Its the biggest flag that I've done so far. I had to cut this from 14 gauge steel to keep weight down. I really don't like working with metal this thin. I would prefer to use 1/8" (10 gauge) or thicker but for this flag, I had to keep the weight down. Either way, I think it turned out great. 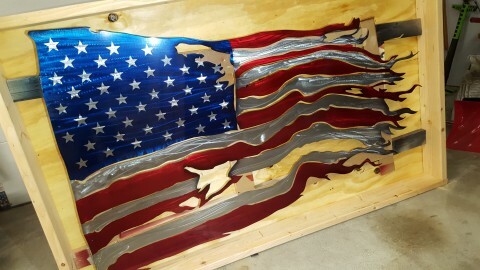 You'll notice the 2x4 frame that I mounted the flag to while I was working on it. The other pictures show the flag in the crate that I built for shipping to California.